The SSL G-Series mixing console is a classic in the mixing world, especially those in the pop and rock worlds. Not only has the console been used to mix dozens of classic records, but it continues to be used today. Of course, most of us unfortunately can’t afford to buy an SSL mixing console, which is where emulations come in. Brainworx is the latest to develop a G-Series channel strip emulation, called the Brainworx bx_console G.
While cheaper than an SSL console, the plugin still costs $300 — although until September 30 you’ll be able to get it for $179. Should you pull the trigger on it? We put the Brainworx bx_console G to the test to find out. The first thing you’ll notice about the Brainworx bx_console G is its design, and it’s clear that Brainworx has built the emulation to stick close enough to the real thing. There are three columns of controls in the plugin, with the first offering filters, the compressor, and the expander, the second offering EQ, and the third offering gain and phase controls. It’s a good layout — if you’ve used G-Series emulations — or the real thing — before, then you’ll be able to grasp the design immediately, and if you haven’t, then it’ll still be relatively easy to adopt. One cool feature about the plugin is that you can set four scenes and then switch between them — so, if you want to A/B a series of settings, you can use the lettered selections at the top of the user interface (A, B, C, D), to quickly and easily switch between scenes. You can also save and load presets, which allows for an easy starting point for those looking to get quick mixes done. 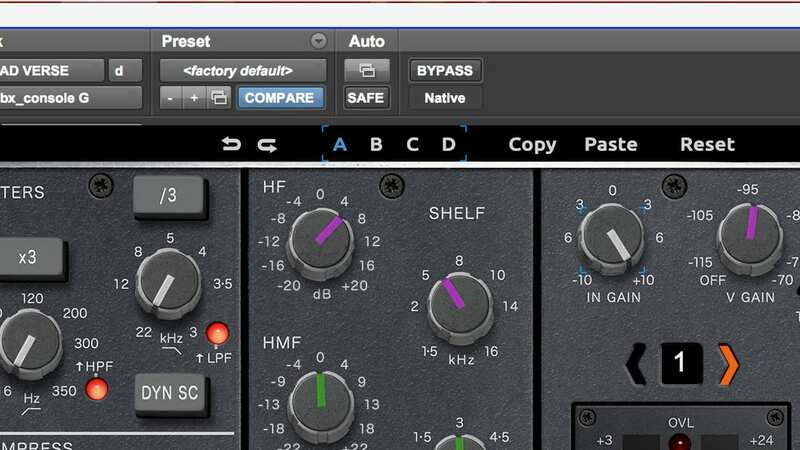 You can also switch between E-Seres and G-Series compression, And change EQ types between a shelf or bell shape. You’ll even get a way to dial the saturation of the of the plugin with a little THD (total harmonic distortion) knob. While the interface may take a minute or two to get used to, the fact is that it’s extremely easy to figure out, and once you do you’ll love how it sounds. Design is important enough, but not as important as sound — and thankfully the Brainworx bx_console G sounds great. That’s not unexpected from Brainworx — the company has made a series of excellent emulations over the years, and the bx_console G is no different. The G-Series console was known for delivering a powerful yet slightly more mellow sound than the E-Series, and that’s certainly not surprising when you hear the G-Series in action. A good word to describe the overall sound of the plugin is “smooth.” That’s not to say that you can’t work the compression to get that pump effect — you can. But it’s a little more adaptable than the E series, and we think that’s a good thing for a plugin built for versatility. Speaking of versatility, the bx_console G really is pretty versatile. 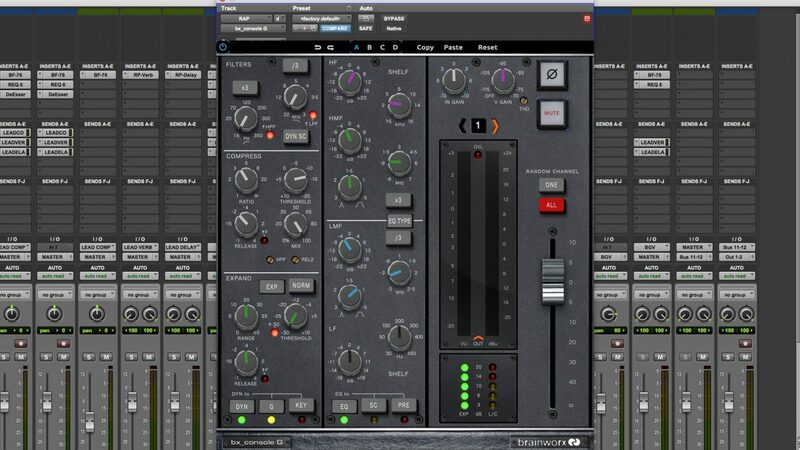 Some suggest that channel strip plugins like this are best served at those who want to build a quick mix without having to devote multiple plugins to compression and EQ, but we would argue that this really is the complete package. Sure, sometimes you might want to divert from the bx_console G for things like compression on a lead vocal or to more surgically EQ something, but it wouldn’t be out of place to start a mix with bx_console G on every track as a starting point. The Brainworx bx_console G is an absolute beast. Not only is it well-designed and generally easy to use, but it also sounds great. Full disclaimer: we did not have a G-Series console at our disposal during the review of this plugin, which is why we didn’t compare the hardware and this emulation, but the fact is that accurate or not, the bx_console G is a great addition to any studio’s plugin list — home studio and pro studio alike. That’s especially true for the special price of $179, but even at $300, for those looking for a channel strip plugin, we think this is one worth investing in. Check out the links below to buy the Brainworx bx_console G for yourself, but keep in mind you only have until September 30 to get the plugin at $179, after which it’ll jump to $300.